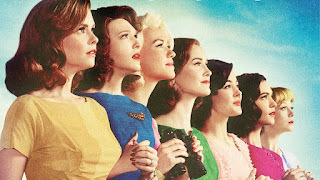 Today's post is all about a great new show I've quickly become obsessed with! I first heard about it from Julie, who is also a fan! So far I've seen the first two episodes and it's already got me hooked! I'm hoping to get my hands on a copy of the book at some point, which I found on Amazon easily enough. If you enjoy anything from the Space Age era in the United States, I'm quite sure you'll enjoy watching this show! The show was developed by Stephanie Savage for ABC, and is based on Lily Koppel's book of the same name. 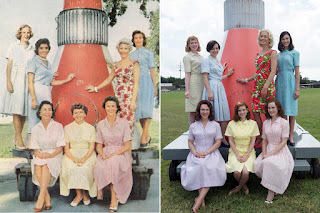 The series documents the story of the wives of the Mercury Seven astronauts, namely: Alan Shepard, Gus Grissom, John Glenn, Scott Carpenter, Wally Schirra, Gordon Cooper, and Deke Slayton. 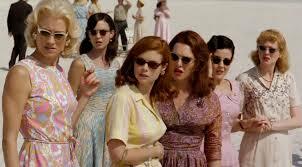 Personally, I love period pieces from the 1950s and 1960s. Although I certainly wasn't alive back then, I find the era incredibly fascinating! I've always joked that if I could have lived in any other time period, it would have been then! I love the outfits, styles, and attitudes depicted in the show, and the friendship and sisterhood that has been developing with the wives. 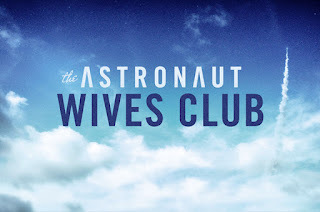 I've tried to encourage my mum to watch it with my dad since he's interested in NASA and space exploration. I won't deny that the show is geared towards women (after all, it's all about the wives), but that's not to say that it isn't enjoyable for men to watch. The cast is great, and even features two notable actors from Dexter (Yvonne Strahovski, and Desmond Harrington).